A detective mystery featuring an insufferably supercilious and condescending professor of criminology and his somewhat timid student/assistant, who he is privately coming to think is terribly clever and perspective, but whom I think is just sensible. He is apparently called on by the police to help out in various homicide investigations where the police are dumbfounded. Kind of like Sherlock Holmes — same smugness and superiority without the charm. OK, Sherlock Holmes had no charm either. He, too, was insufferably supercilious and condescending. Professor Stuart McCauley embarks on a case of serial murders in the subway, each victim a young woman, gutted and disfigured with a big cross sliced across her thoracic region. 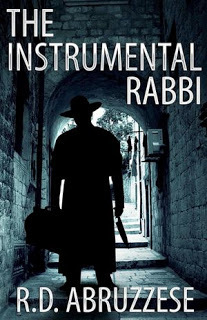 We meet the killer first in the guise of a priest, then a young woman sees another attack from her apartment window, this time by a rabbi, and i which is so horrific that after her words on her 911 call, she never speaks again and eventually commits suicide. Meanwhile, the young assistant to the professor seems to have no lasting psychological scars from listening to the tape of the call nor of seeing the body. Go figure. This is the 17th slaying. Meanwhile, we are introduced to some employees of a a large pharmaceuticals company with facilities nearby, and wonder what that has to do with the murders. Obviously something, or why bring it up, right? Well, my dear sillies, of COURSE it has something to do with the murders. But just what, exactly? Meanwhile, the bodies are piling up like logs for the coming winter, and now we have suspicious deaths that are not in the subway and not young women. All in all, an interesting mystery, an unlikable smart guy, and what I consider to be an insulting trope of the police being too stupid to see the little details and have to go trialing along in the wake of The Great Detective. Oh, don’t mind me. I’m just getting a little jaded from reading so many mysteries. Elementary, my dear readers. 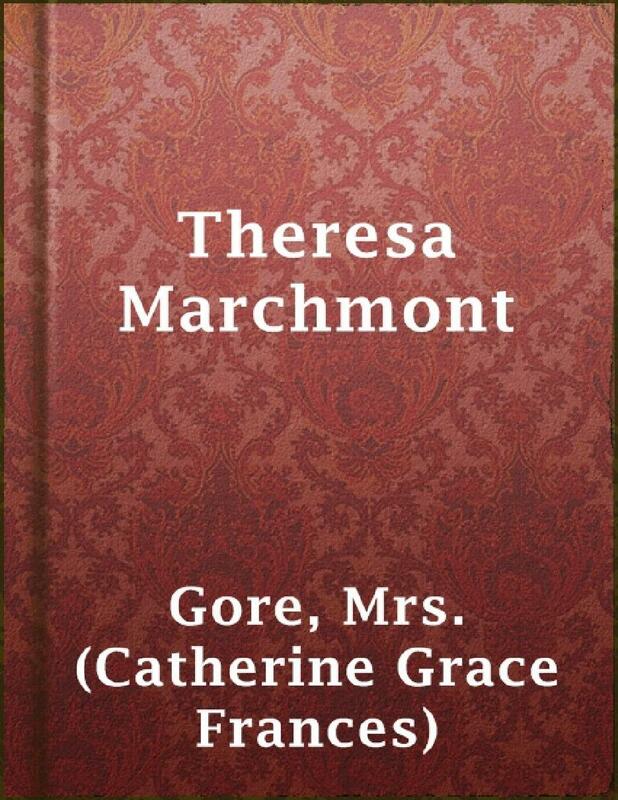 Mrs. Charles Gore, Mrs. Gore, or Catherine Grace Frances, or Catherine Francis Gore, wrote this novella in 1824, back in the days when lady authors often used their married name. Imagine signing something you write today as Mrs. Dinktwaddle, rather than Elsie Dinktwaddle. We’ve come a long way, baby. Sort of. Mz Gore was an extremely popular writer in her time, and also extremely prolific. She wrote about 70 novels. Theresa Marchmont was her first work, and set her on the road to success. Wiki tells us that she is among the best known of the silver fork writers – authors of the “long” Regency era depicting the gentility and etiquette of high society. Her most popular book was Cecil, or Adventures of a Coxcomb which was published in 1841. I might give that one a go if I can find it. Her works are available on a number of sites for free. I obtained this book from Project Gutenburg. The story is set in the autumn of 1676, and is the story of a duped wife, who finds herself married to a bigamist. Of course the bigamist has a jim dandy reason for keeping the information about the other wife secret. Yeah, they all do, don’t they, even back in 1676. The reason that Lord Greville has this secret is that his first wife is nutty as a fruitcake, so he keeps her at his least favorite family seat, Greville Cross, a gloomy, gothic ruin. Of course. Where else? She is looked after by some old loyal family retainers, leaving him at liberty to bustle about the court of King uummm …. Charles. Yeah. King Charles II, a randy old dude with a royal eye for the ladies. OK. Jane Eyre was published in 1847. Hmmmm. Something to ponder. An interesting resolution to the problem ensues, a clear example of the very few choices nice gentlewomen had at the time in order to save themselves and their reputations. High drama, Victorian Era style. This is a fantasy novel. Yeah, I guess so. Ya don’t see many dragons these day in Real Life. 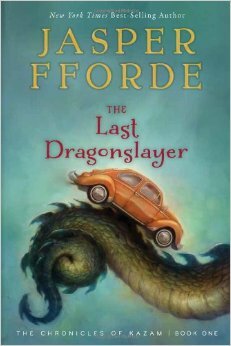 Fforde is the author of the Tuesday Next series, which I read before I started the blog, and someday I may get around to writing up those books. But now we are here to talk about dragons in this alternate world in England, where there are a number of independent kingdoms, known as the Ununited Kingdom. He is a funny writer. Not one-liner funny, situation-funny. Our protagonist is a 16-year-old girl, a foundling, raised by the Order of the Lobster, a charitable organization, when they found her abandoned in an old Beetle Volkswagon. At age twelve, she was indentured to the Kazam Mystical Arts Management under the tutelage of its owner, Mr. “The Great” Zambini. When we meet Jennifer Strange, she is 16 and running the company, because Mr. Zambini has disappeared. In this world magic is very hit and miss, and the wizards who can do it are a motley bunch that need all Jennifer’s skills to keep the thirty-eight barely sane sorcerers at the creaky Zambini Towers focused on their jobs. This Hereford-based company uses the now-failing power of wizards to do such mundane jobs as installing domestic electrical circuits by telepathy or delivering live organs by flying carpet. The death of a dragon is foretold, and a four hundred year old spell starts to unfold in front of her. Does the last dragon have to die? And why has she been chosen to be the Last Dragonslayer? See what I mean about the funny? But what about the magic? Explaining magic is like explaining lightning or rainbows a thousand years ago; inexplicable and wonderful but seemingly impossible. Today they are little more than equations in a science textbook. Magic is the fifth fundamental force, and even more mysterious than gravity, which is really saying something. Magic is a power lurking in all of us, an emotional energy that can be used to move objects and manipulate matter. But it doesn’t follow any physical laws that we can, as yet, understand; it exists only in our hearts and minds. King Snod is just as greedy as anyone else, and runs a tight ship. The King doesn’t make jokes, Miss Strange. On the rare occasion that he does he circulates a memo beforehand to avoid any misunderstandings. The book culminates in an extremely satisfying ending that I never saw coming. Maybe some of you will. You are all so much smarter than I.
I love a good mystery, well-plotted and well-written. And that is exactly what we have here. 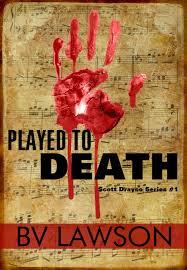 It features Scott Drayco, former concert pianist until an arm injury sidelined his career, former FBI man until he couldn’t take the paperwork any more, and now a P.I. of sorts. He seems to get paid in odd gifts, the latest being a decrepit and abandoned Opera House in a small town on Maryland’s Eastern Shore, the town long abandoned by the tourists as well. He is contacted by a resident of the town to hire him, and Drayco agrees to meet the man in the deserted Opera House. He figures he will take the opportunity while in the town to make arrangements to sell the place. Renovating it seems out of the question, since his finances are in pretty sad shape. However, finding his not-yet-client shot to death and lying on the stage of the old place puts a crimp in his plans, as he feels he should stay to help the embattled local sheriff who is faced with a deputy roster shot down by the mumps. Drayco’s contacts with the local populace reveal their desire to try to get the town back on the tourist map again, which might happen if the plans of a condo developer go through, which would entire the sale of waterfront property owned by the dead guy, and another piece owed by his rival. The dead guy didn’t want to sell, the other guy does. Draco also runs into the pervading sentiment of the townspeople for the old opera house, in which the famous pianist once played before WWII. Upon her return to her native England, she had planned to return to the town, but was killed before that happened. Another murder, this time of the wife of the dead guy, puts the pressure on both the sheriff and Draco to resolve this situation, find the perp, and decide what to do about the opera house. Like I said, I love a good mystery. This Lord Peter Wimsey mystery by Dorothy L. Sayers (and what mystery lover doesn’t know who Dorothy L. Sayers is), was written in 1930, and is particularly interesting for its description of British life at that time, a time when if you wanted to buy some arsenic to kill some vermin, cure your ills or knock off an inconvenient spouse or enemy, all you had to do was trot yourself down to the nearest chemist (that’s a pharmacy to you Yanks) and sign the book, and waltz out with what you need. No ID needed, just sign the book with whatever name you choose. Ahhh, those were the days, the Golden Era of Crime. In Strong Poison, Lord Peter first meets Harriet Vane, an author of police fiction. The immediate problem is that she is on trial for her life, charged with murdering her former lover. By poisoning him. With arsenic. She claims that her purchases of arsenic under two different names, neither of which were hers, was simply testing her theory for a new mystery story she was writing, of how easy it would be for any schlub to buy arsenic. Yeah, yeah, yeah, we’ve all heard that one before, haven’t we. Anyway, Love blooms, apparently, even if she is a murderer. Oh, wait. Maybe she is not, and Lord Peter will have to do some fancy detective work to prove her innocence. I won’t keep you in suspense. They get married. Extra! Extra! Read all about it! Here, in Busman’s Honeymoon. I used to think that only the old British mysteries were any good, but I’ve been reading so many great ones lately by current authors that I take it all back. But really, Sayers and Agatha Christie have set a very high bar. Very high indeed. Oh! Almost forgot. 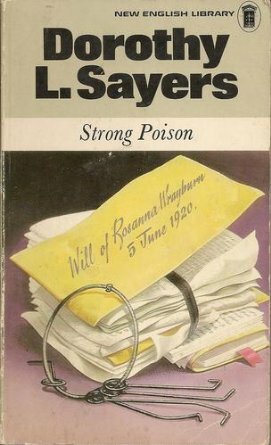 Hat tip to Deb Atwood for reminding me about this title when I talked about poisoning in Barry Maitland’s Dark Mirror. Thanks, Deb. Poisoning: the gift that keeps on giving. This is a mostly irreverent and mostly true memoir of a gal who climbed the corporate ladder in the world of finance, doing PR work. 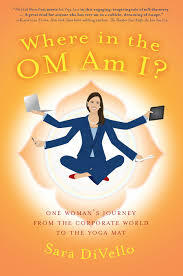 This is a memoir based on my personal experiences working in financial services and attending yoga teacher training. While the characters in this book are based on real people, names and identifying details have been changed to protect privacy, and in some cases, characters have been combined for the sake of protecting privacy as well as for narrative purposes. I found this book irresistible and I am not sure exactly why. Well written? Certainly. Characters a little over the top? For sure. Funny? Oh, yeah. But serious too, in a straight forward account of what she felt was a miserable, soulless corporate existence which she hoped to escape from time to time by attending yoga classes, and eventually signing up for yoga teacher training. Self-deprecating in that chic lit kind of way, but insightful all the same. I do admit to wanting to grab her by the shoulders, shake her and yell, WTF! Get out of that career field, you dolt! You paid off your student loans, you bought a condo, and a car. Why get sucked in further into a lifestyle you obviously hate. Productivity is the junk food of career satisfaction — it makes you feel full, but nutritionally, it doesn’t provide what you need. Her hope for a haven of peace and Zen-ness in the yoga teacher training was dashed when it became clear that the folks involved in this scene were just as nutty and driven in their own wacky way as the people in her office. And yet, what had I, who was supposedly pursuing the yogic path, done when confronted? Why, I dumpster-dove straight into ego, material possession, and combative wordplay of course! And beyond that, I’d retreated back to my corporate identity like a coward. Change is difficult. It is easier to keep on doing what you know than to make great changes in your life, no matter how unhappy you are. And of course, the money didn’t hurt either. You will be pleased to know that in spite of it all, she finds a nice guy, gets married, and gets pushed out of her job. Well! THAT made making those changes a lot easier! Like I said, I really liked this book. Perhaps you will, too. Oh. By the way, I wasn’t altogether clear on the difference between a memoir and an autobiography. So I did what any other red-blooded ignoramus person who did not know would do, I googled. Seems that an autobiography covers your entire life, while a memoir is only about a certain portion of it. So there you have it, folks. Another day, another tidbit. Here’s a murder mystery with a different twist. It’s set in ancient Egypt, in the reign of Pharaoh Senusret III, whose dates are 1878 BC to 1839 BC, which was a time of great power and prosperity. Pharaoh Senusret III was the fifth monarch of the Twelfth Dynasty of the Middle Kingdom. He was the one who achieved the building of the Canal of the Pharaohs, and was one of the few kings who were deified and honored with a cult during their own lifetime. If you care. I could have just read through this book and enjoyed it, but I doubly enjoyed it because I looked up all the stuff I didn’t know about this time. Which was pretty much everything. Like Maat. The series is apparently called In Maat’s Service. Well, la di dah. Who is Maat? Yeah, well, who is Anubis for that matter? Google to the rescue! Maat represents the ethical and moral principle that every Egyptian citizen was expected to follow throughout their daily lives. They were expected to act with honor and truth in manners that involve family, the community, the nation, the environment, and god. The King would describe himself as the “Lord of Maat” who decreed with his mouth the Maat he conceived in his heart. Maat was usually represented as a young woman, sitting or standing, holding a was scepter, the symbol of power, in one hand and an ankh, the symbol of eternal life, in the other. 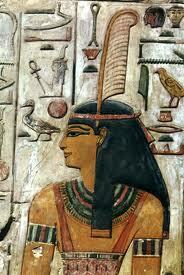 Sometimes she is depicted with wings on each arm or as a woman with an ostrich feather on her head. 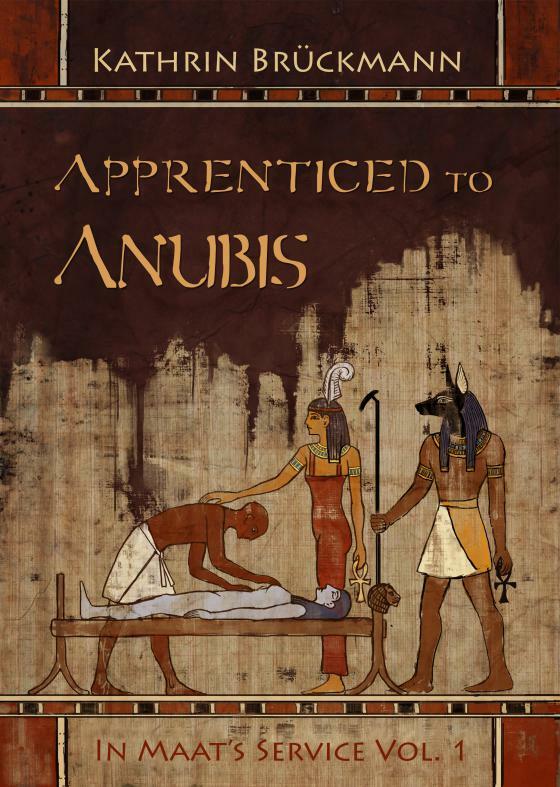 Now for Anubis, in whose service our protagonist is placed. Anubisis is the Greek name of a jackal-headed god associated with mummification and the afterlife in ancient Egyptian religion. He attended the weighing scale during the “Weighing of the Heart.” He was depicted in black, a color that symbolized both rebirth and the discoloration of the corpse after embalming. Later on he seems to have been combined with Wepwawet (also called Upuaut), another Egyptian god portrayed with a dog’s head or in canine form. Like many ancient Egyptian deities, Anubis assumed different roles in various contexts. 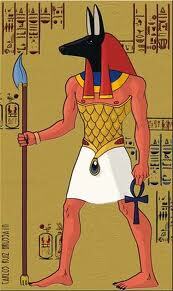 Depicted as a protector of graves as early as the First Dynasty (c. 3100 – c. 2890 BC), Anubis was also an embalmer. This is Anubis on the left. Looks kinda like a Doberman Pinscher. Now, why are we interested in Maat and Anubis? Because our protagonist, young Hori has just finished his training as a doctor, and passes the oral exam. After a celebratory party held by the son of the Vizier, they all go off to a bar, where the son of the Vizier tries to molest a young serving girl. Hori, being the dutiful follower of Maat that he is, tries to prevent further abuse, knocking the guy, who trips and falls, hitting his head and dying. The father, being quite powerful, tries to bribe witnesses to claim that Hori deliberately killed the youth. Fortunately, enough witnesses tell the truth, and the young Pharaoh Senusret has to walk a fine line here between justice and the wishes of his Vizier. Instead of condemning Hori to death, or to a life sentences in the stone pit, (pretty much the same thing), he sentences him to life in The House of Death, the weryt, an intensely secret place on an island where the dead are brought, cleaned, and embalmed. However, this means that although Hori is allowed to live, he can never leave the weryt, and it would cause his death to reveal any of the secrets from there to anyone outside the weryt. It is during his work here that young Dr. Hori discovers that several young girls who end up on his embalming table have the same kind of puncture wound. He sees a pattern, and believes they have been murdered. But by who? And why? And so begins our tale. A good mystery woven throughout with the thoroughly researched details of life in that time in ancient Egypt. You may learn just a bit more about the embalming practices of the Egyptians that perhaps you quite wanted to, but I loved it. So all in all, the book has all the elements that I like in historical mystery fiction: a feeling of authenticity of the period, a decent mystery, some likable characters that we can cheer for, and enough detail that I can learn something new. Kathrin Brückmann is a German writer, living in Berlin, and the original is in German, so we must give due kudos to the fine translation of Edith Parzefall. I believe further adventures of Doctor Hori and his best friend, Doctor Nakhtmin are planned. I certainly look forward to reading them.